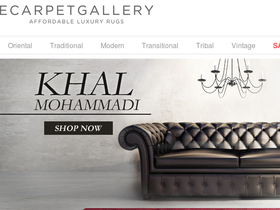 eCarpetGallery, online at eCarpetGallery.com, is your ultimate source for designer rugs. eCarpetGallery offers oriental rugs with origins from Persia, India, China, Afghanistan, Pakistan, or Turkey, all in a wide array of sizes, shapes, colors, and styles. Plus, not only do they carry rugs, but they also sell kilims, antiques, silks, and padding. Check out RetailSteal.com for all the best eCarpetGallery deals, eCarpetGallery coupons, and eCarpetGallery promotions. eCarpetGallery offers free delivery on all orders within the contiguous US and Canada. They also ship to Hawaii, Alaska, the US Virgin Islands, and Puerto Rico with a shipping cost. See eCarpetGallery.com for rates and details. Check out eCarpet Gallery and save on shipping with free shipping on orders $250+ to contiguous USA and Canada. Shop at eCarpet Gallery and enjoy 55% savings on Turkish Rugs. Click here for code. Shop at eCarpet Gallery and save 85% off the Bokhara collection. Click link to get started. At eCarpet Gallery, get up to 80% savings plus free shipping on handmade rugs. Click link to shop online. Check out the sale section at eCarpet Gallery and save up to 75% off a wide range of carpets and rugs. Click link to start shopping. Save up to 60% or more on Afghan Rugs eCarpetGallery.com. Click to save. Hurry over to eCarpetgallery.com and save 60% off all Tribal rugs with coupon code. Shop EcarpetGallery.com and save 25% discount site-wide with coupon code. Click link to save now. Save $30 on Natural Area Rug purchases of $299 or more with this coupon code! Save $50 on purchases o $299 or more from Natural Area Rugs online when you enter our coupon code at checkout. Click link. Use our coupon code at Natural Area Rugs online to get a 12% discount on your order. Click link to shop. Save 10% on your Natural Area Rugs purchase of any contemporary rugs when you use this coupon code!